Welcome to the SEAOSC Safer Cities Reconnaissance Blog. 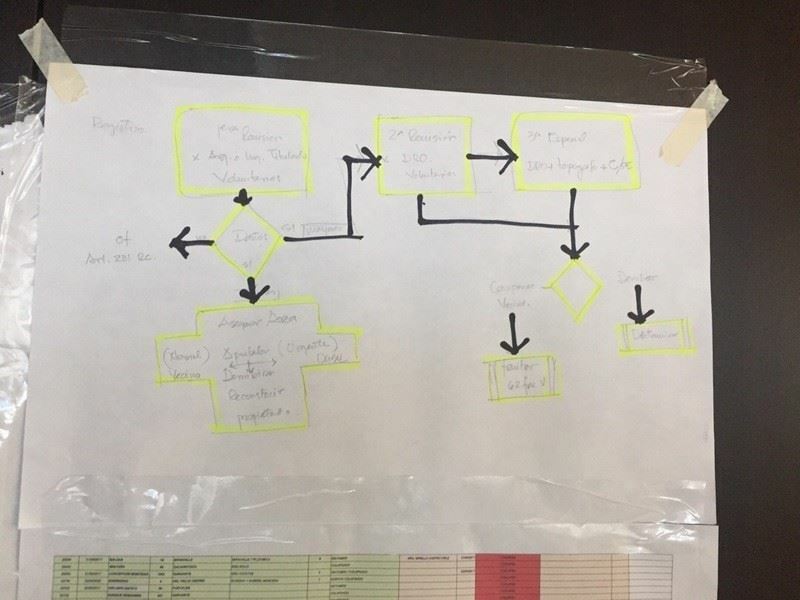 It is intended to provide observations from post-natural disaster reconnaissance trips to help inform on what worked and didn’t work as well as on response, recovery and preparedness effectiveness. Please review the Blogging Rules and Etiquette. Be sure to subscribe and share this blog as well follow our social media updates with your friends and colleagues regarding these important efforts. 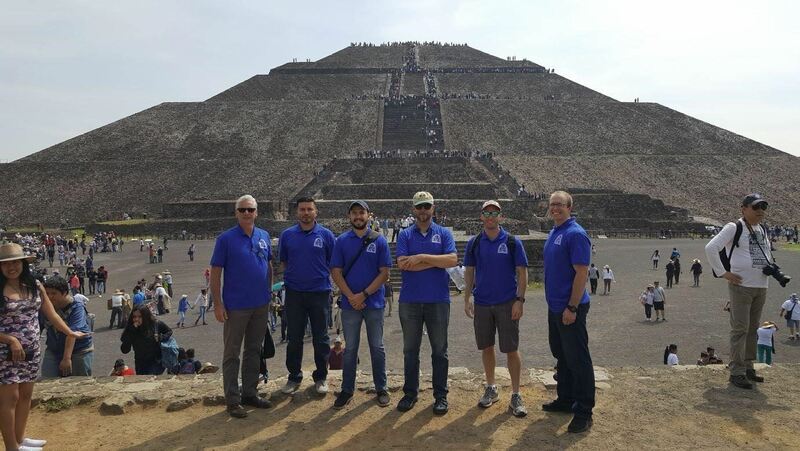 Safer Cities Reconnaissance Team in front of "Piramide del Sol" in Teotihuacan, Mexico. Left-to-Right: Ken, Daniel, Raul, Marty, Dion and Russell. The SCRT observed dozens of buildings throughout the week. The buildings varied in terms of size, shape, construction year, type of construction and location. 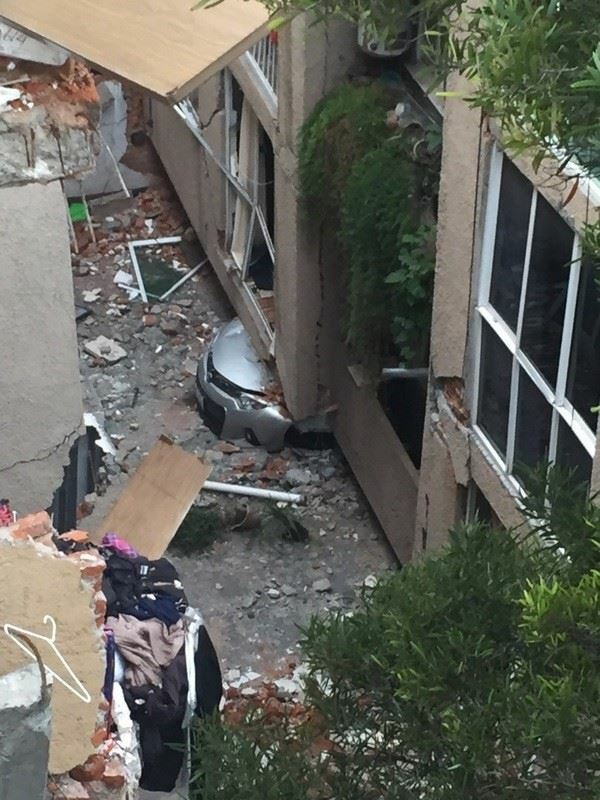 Most buildings with severe damage were 4 to 8 story non-ductile concrete (NDC) slab-column frames with unreinforced masonry (URM) infill walls constructed prior to 1985. According to Benito Juarez Municipio Architect Alejandro Santiago, URM infill walls are considered a non-structural component of the building and are not designed to resist gravity or lateral loads. The infill walls are constructed with no gap between the concrete columns and slab. This often cause the buildings to behave, at least at initially, as shear wall buildings. Also, because it was not considered in the structural design of the building, certain layouts of infill walls caused horizontal or vertical irregularities. 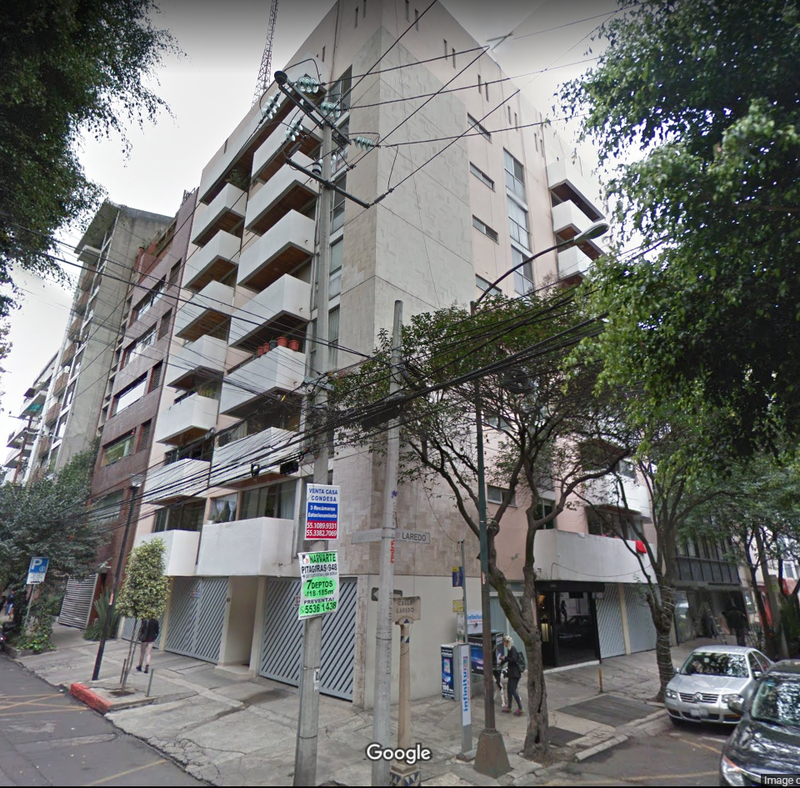 Weak/Soft Story: Many severely damaged buildings were multi-unit residential with open wall lines and open areas at the ground floor to allow for parking. Damage was concentrated at the soft/weak story, sometimes leading to collapse of the story. Soft/weak stories were present in these buildings when a story contained significantly less URM infill walls than adjacent stories. The 517 Tokyo Buildings (Figures 1 and 2) are examples of buildings with soft/weak stories leading to severe damage or partial collapse. Figure 1- 517 Tokyo Building (Building 1)- Soft/Weak Story Multi-Unit Residential Building caused by open parking areas at the ground level. Figure 2- 517 Tokyo Building (Building 2)- Soft/Weak Story Multi-Unit Residential Building caused by open parking areas at the ground level. A potential soft/weak story was created in the 149 Calle Sonora building (Figures 3 and 4) where the 6th floor fully collapsed. The SCRT noticed it was strange that the collapsed floor was one floor above the story that is typically affected by building pounding. A nearby neighbor informed the SCRT that the owner, who unfortunately passed away in the collapsed floor, owned the entire floor and recently remodeled it. One can only wonder if the remodel included removing masonry infill walls to open the space causing a sharp reduction in strength and stiffness at that story. A transition in smaller column sizes may have contributed to the story's collapse. 1. 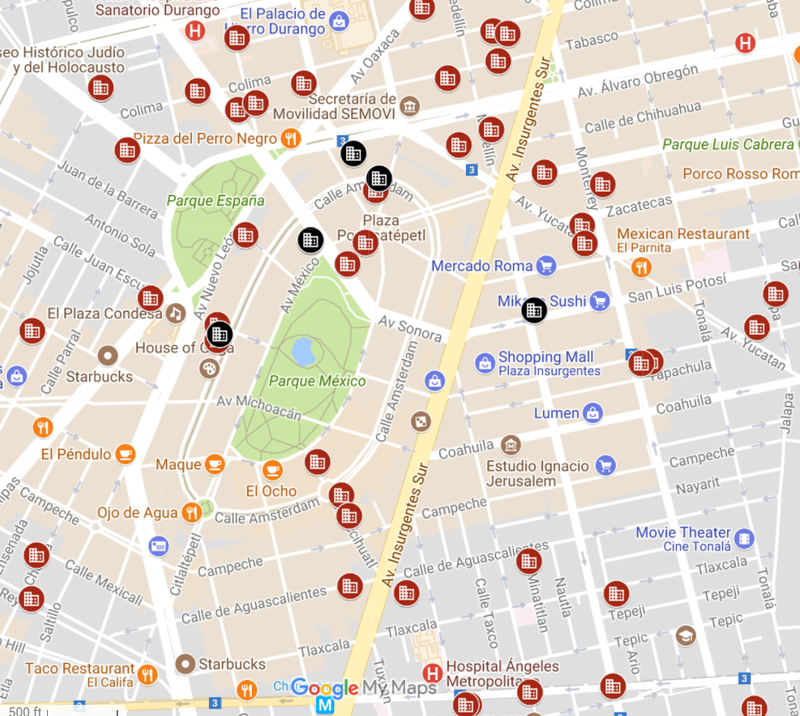 Torsion: Building damage maps, such as the map shown in Figure 5, provided by Dr. Luciano Roberto Fernandez Sola from Sociedad Mexicana de Ingenieria Estructural (SMIE) (www.sismosmexico.org), show many severely damaged buildings were located on a street corner. Corner buildings typically have highly perforated elevations facing the street and solid walls on the back wall lines facing neighboring buildings creating disproportionate strength and stiffness between opposite perimeter wall lines of buildings located on street corners. 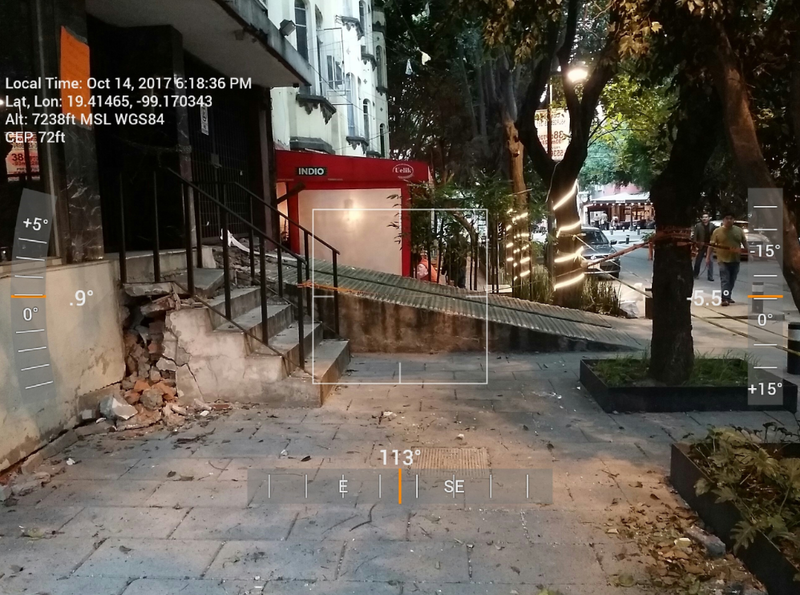 In Colonia Condesa, one of the most heavily impacted neighborhoods many severely damaged or collapsed buildings were on street corners. At the collapsed 107 Amsterdam Building, shown in (Figures 6 and 7). 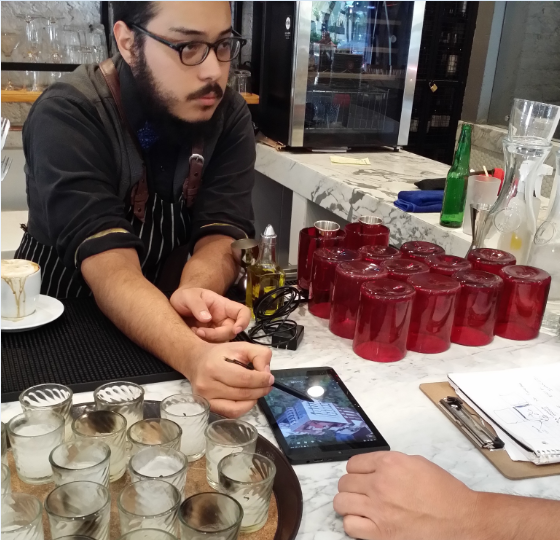 Our team interviewed restaurant employees across the street. These employees witnessed the collapse of the structure from within their restaurant. According to them, the building moved in a direction indicating the building could have been twisting. 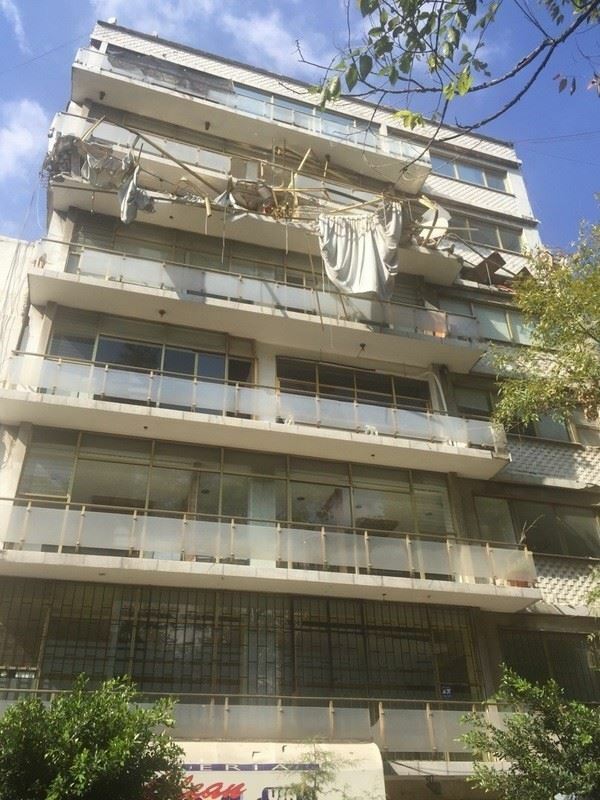 The workers recalled the building shedding plaster and decoration on the elevation facing the street followed by walls in the top story falling out of plane causing the roof to collapse. Next, the corner bottom piers gave out and the building came crashing down towards the street. At times it was difficult to fight back tears as the employees recounted their experience. 2. Pounding and Group Effects: Most of the affected zones contained older buildings where seismic gaps were non-existing or very small. As such, many of the buildings observed had some damage due to pounding. The SCRT observed damage from "group effects", where end buildings along a line of closely spaced buildings collapsed or had excessive residual drift. During the earthquake buildings swayed together back and forth as one unit, leaning against each other causing the unfortunate building at the end to have a greater amount of residual displacement. Damage from group effects was perhaps most noticeable in the city of Jojutla as shown in (Figure 8). Where damage from group effects occurred, buildings not on the end of the building line had significantly less residual drift. 3. URM Infills: Most of the buildings observed contained URM infills. These infills typically failed in one of two ways: shear failure and out of plane failure. Longer infills typically first exhibit in-plane shear cracks along the concrete frame interface, followed by gradual out-of-plane movement of the infill, and in many cases complete out-of-plane failure. Diagonal shear cracking through URM piers was a predominant failure mechanism where URM sliding shear could not be mobilized. 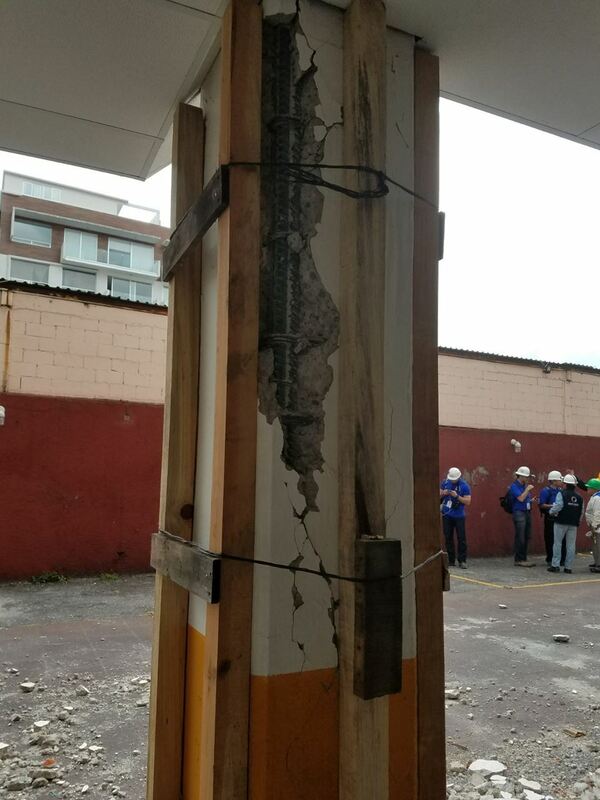 Diagonal shear failure of URM piers extended through surrounding concrete columns in some buildings. This was typically observed in older buildings, where the column size was small (8”-10"). Many of the buildings with this type of damage were evacuated and shored. One example of this was seen in building General Rincon No. 142 (Figure 10). 4. 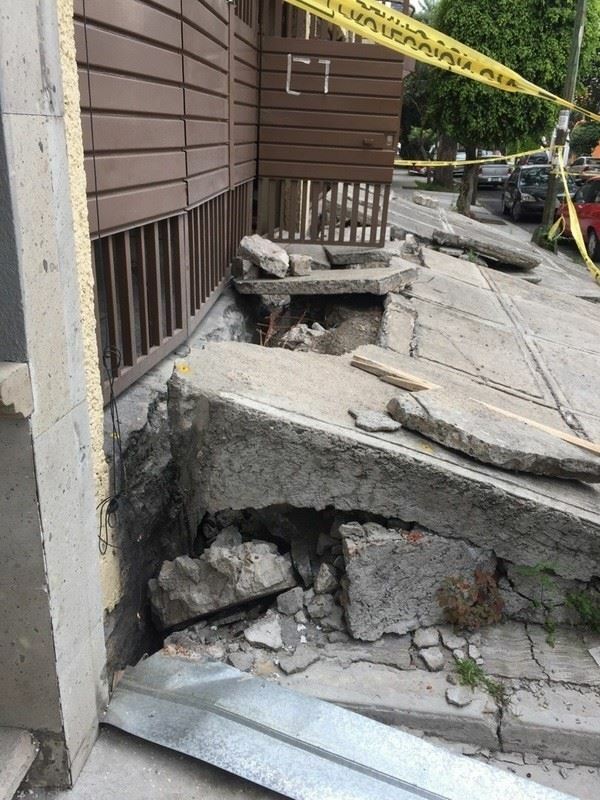 Soil Interaction: The SCRT anticipated soils in Mexico City would have a large impact on building behavior and that there may be foundation failures given the soft soil in Mexico City. The team observed foundation failure in several structures, with observations of significant settlement and signs of possible rocking at the base of the structures. One example was the 81 La Quemada Building (Figure 11, 12, and 13) which literally broke vertically in half. Once on site, it did not take long for SCRT soils expert, Marty Hudson, to determine that large differential foundation displacements had occurred. It appeared that even though the building was on deep foundations those foundations had lost capacity beneath the building until the building cracked vertically due to a lack of continuous reinforcing throughout the structure. Retrofitted buildings were difficult to come by. 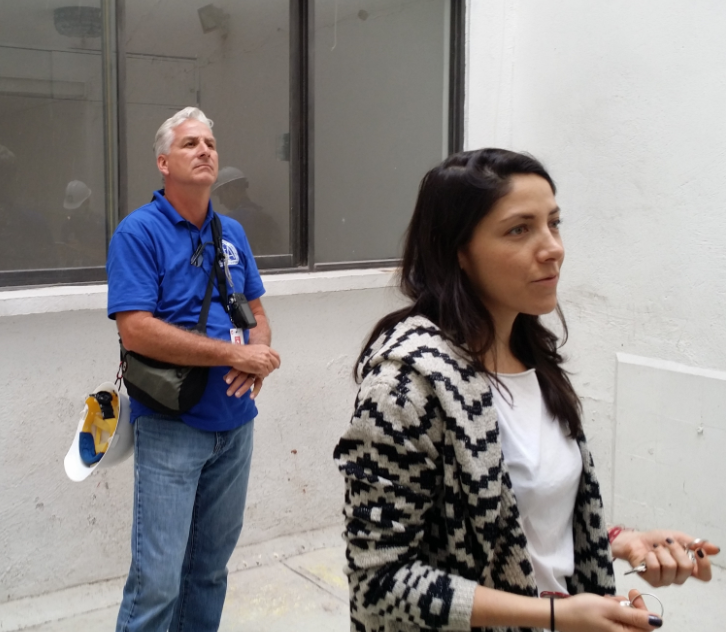 However, the SCRT was able to identify and observe the performance of some retrofitted buildings. The retrofits often consisted of the addition of full height concrete walls or steel braced frames and strengthening the concrete columns. 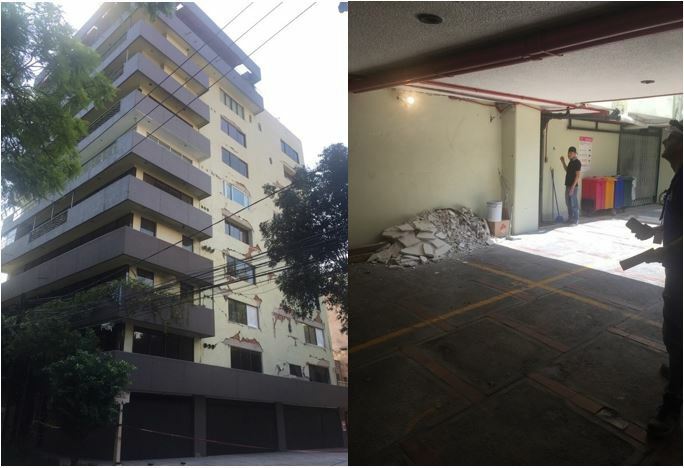 · Building Ave Mexico 55 building (Figure 14) for example had new concrete shear walls with enlarged concrete columns on the ground floor in an apparent attempt to mitigate a soft story deficiency. The retrofit worked well, there was no signs of damage in that floor. The upper floors in the building experienced damage to infill walls. 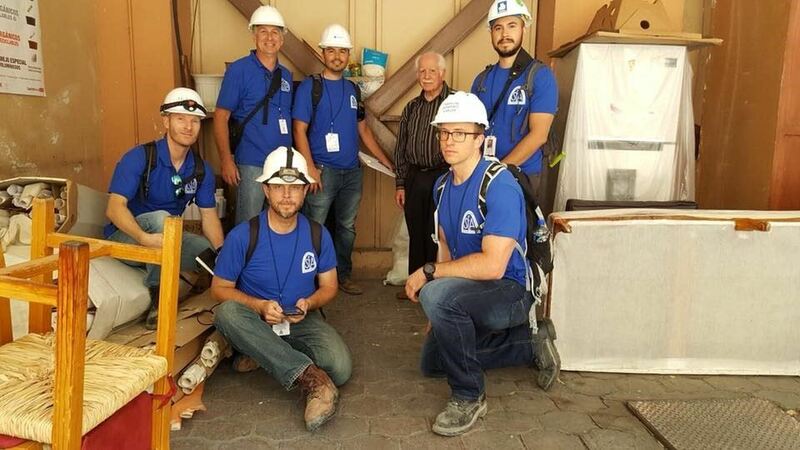 The SCRT team observed a repaired concrete shear wall in the building where epoxy injection was used to fill concrete shear wall cracks presumably from the 1985 earthquake. 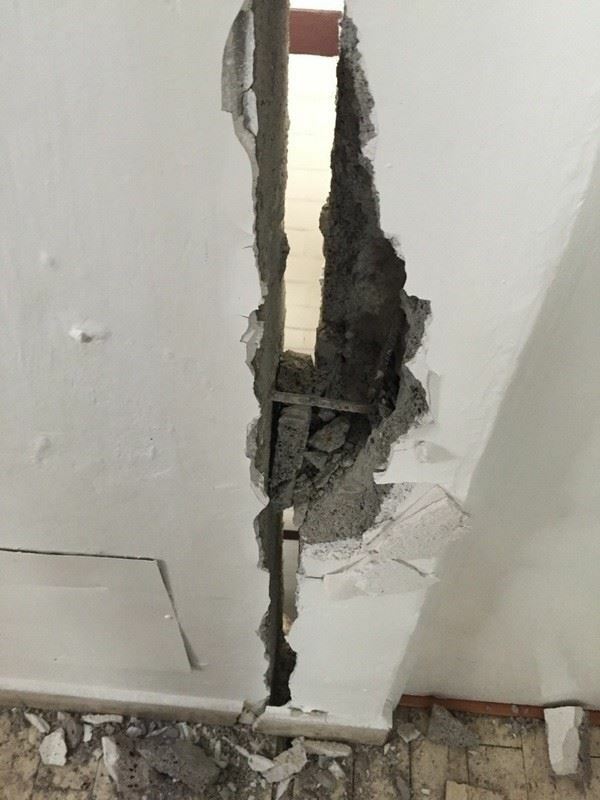 No new cracks were found in the areas of the shear wall observed by the team. 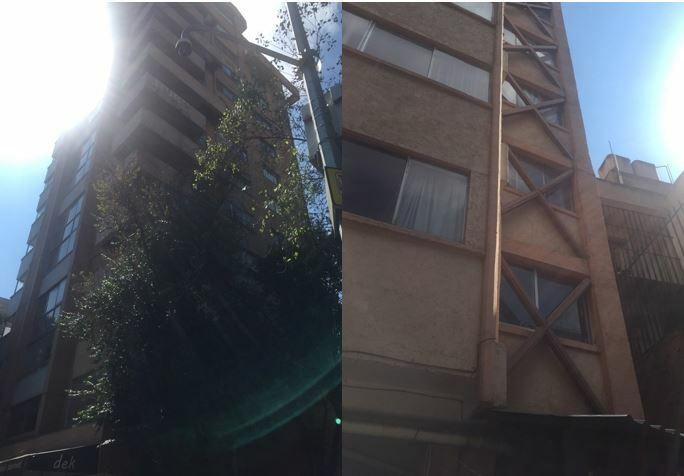 · At the 141 Calle Sonora Building (Figure 15), full height concrete walls and steel braces were added to the building prior to the 1985 earthquake. The building sustained no damage in either the 1985 or the 2017 seismic events. Despite having no damage, the building was evacuated due to the danger of a nearby partially collapsed building. · While some retrofits were effective, others were not. Poor detailing of a steel braced frame used to retrofit the 81 Calle Amsterdam buildings (Figure 16) led to connection failure of some braces and subsequently damage to infill walls in the building. One of the most important goals of the trip was to understand community resilience. Community resilience is not just the measure of building performance, but rather the ability of the community to respond and recover after a seismic event. The team selected two affected areas to conduct their investigation. · Tagging – As expected, the city government is the only entity that has the authority to tag a building. 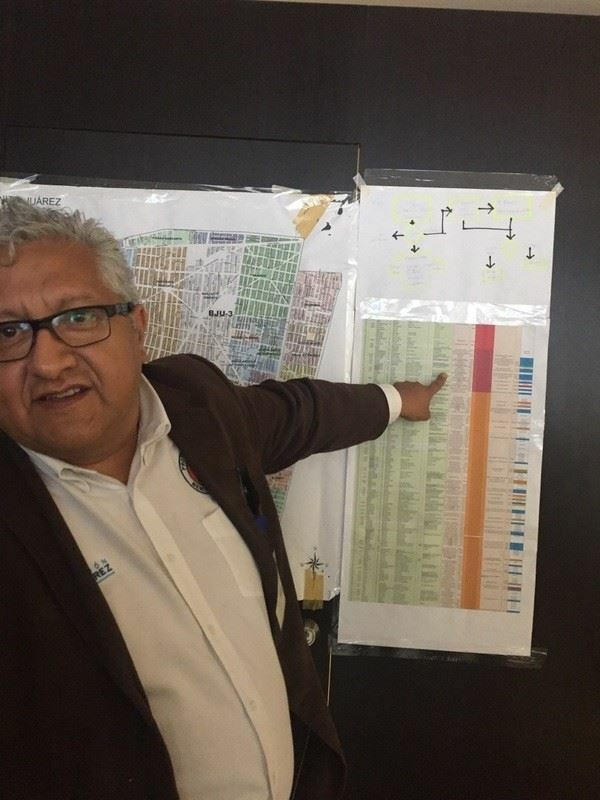 However, because of the large number of affected buildings, Jorge Cruz, the supervisor of the department had to rely on social media and messenger services to get an inventory of damaged buildings. These buildings were then conservatively tagged until an in-person inspection was conducted to verify the damage. This method helped respond to the immediate tagging needs but unfortunately has kept a large number of people out of their homes. As of October 4, 2017, the district had 1,319 buildings requiring a follow-up structural evaluation before allowing people to re-occupy. Unfortunately, the area does not have enough structural engineers to evaluate such a large quantity. The displaced residents were desperate to have volunteer groups like ourselves evaluate their buildings. 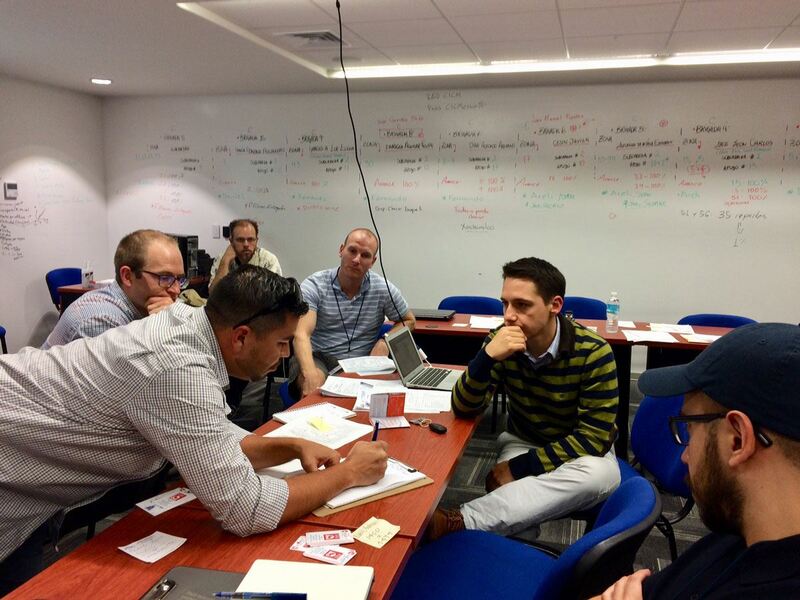 However, the Benito Juarez District requires a license in engineering or architecture in Mexico to tag a building. The best the SCRT could do, was provide our professional opinion of the condition of the structure. 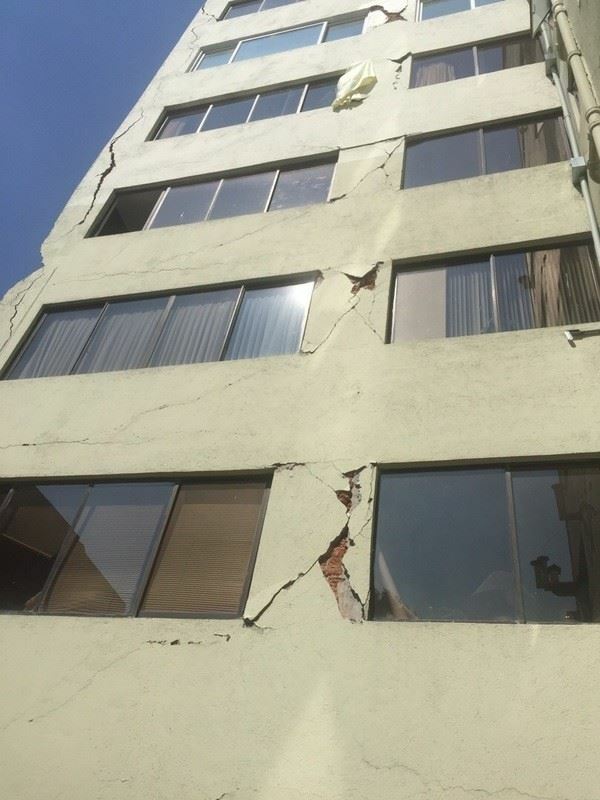 · Adjacent Hazard - Buildings at risk of being damaged by severely damaged buildings were also evacuated. 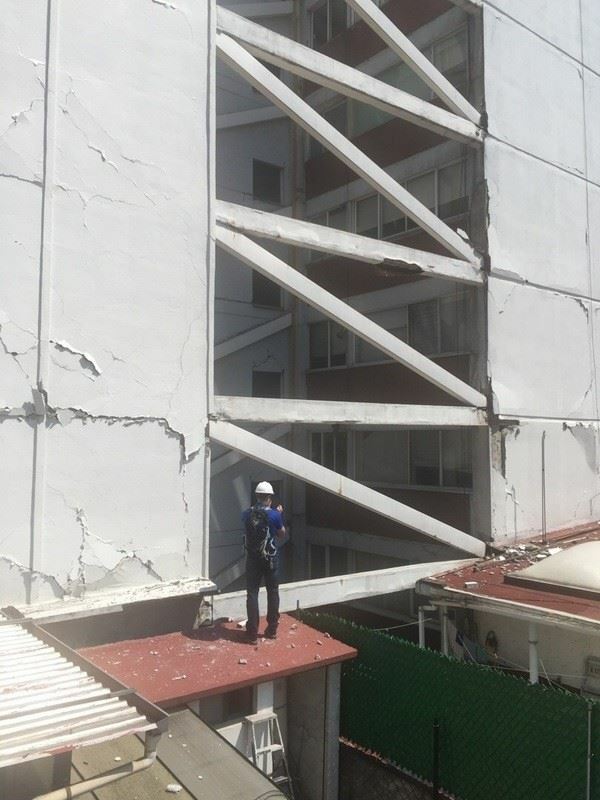 The SCRT witnessed many buildings un-occupied because their neighboring building was on the verge of collapse or was leaning on their building. A good example of this was Xola 32 (Figure 17) where the corner building had been red tagged and the two adjacent buildings on either side were evacuated despite having minimal damage. This angered many of their residents because they felt they had lost their house due to others’ carelessness. 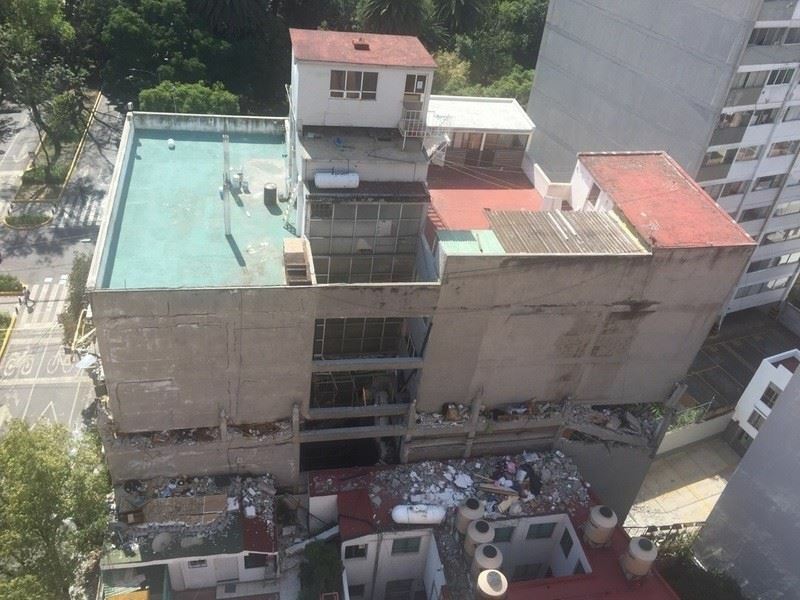 In some cases, the neighbors insisted that the government should order the damaged buildings to be demolished as soon as possible rather than allowing the owner to fix the building which would take significantly longer. 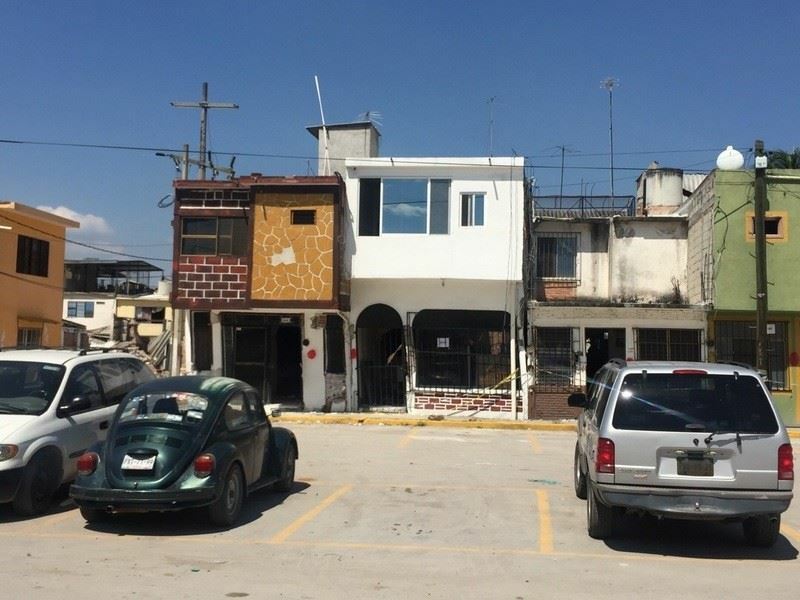 Jojutla: The second example of community resilience evaluated was the small town of Jojutla. Jojutla is a located about 130 kilometers from Mexico City and closer to the epicenter which occurred in Puebla. Although it is a relatively small town of about 50,000 people it serves as the commercial center of the surrounding small villages and towns. For example, the town has the only banks and major retail stores within a 45 minute drive. Unfortunately the town as a whole was devastated after the event. · Natural Gas: Immediately after the event there were explosions which caused most of the town to run in a panic away from the downtown area as they thought the gas station was on fire. As it turns out it was not the gas station, but rather the food market where many of the residents shop for food and groceries. 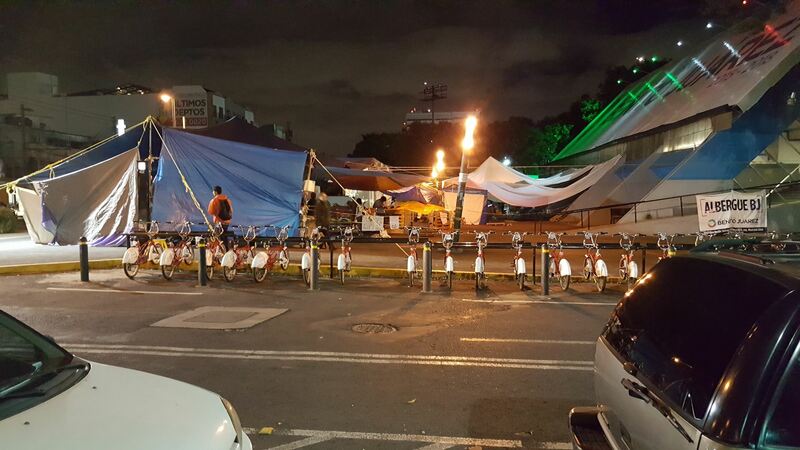 The market was closed for days while the gas leaks were investigated. 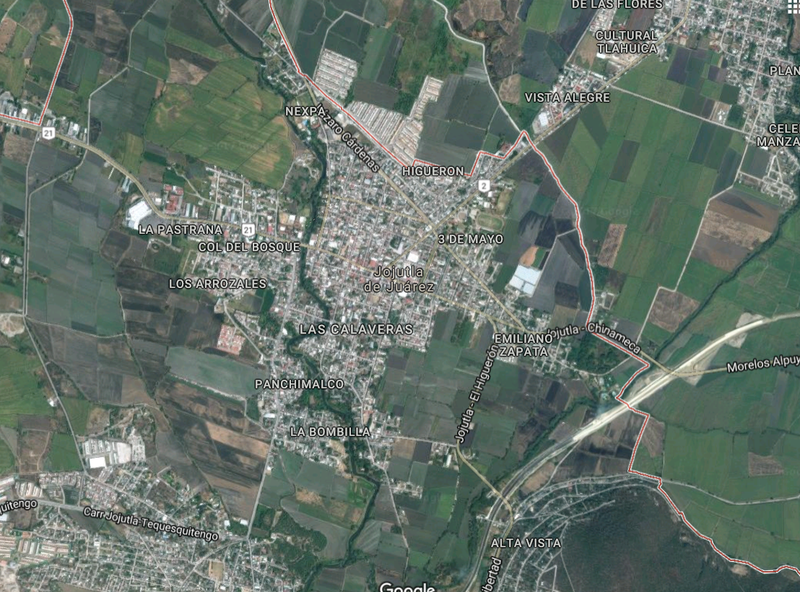 · Water and Power: Colonia Zapata lost water for at least 24 hours after the event. It was not clear to the residents why water was lost, but they believed that it was shut down until the water system was checked for leaks. Unlike the water loss, which only affected a Colonia, the entire city lost power for 24 hours. It was also not clear why the city lost power, but it may have been simply to check the power lines. 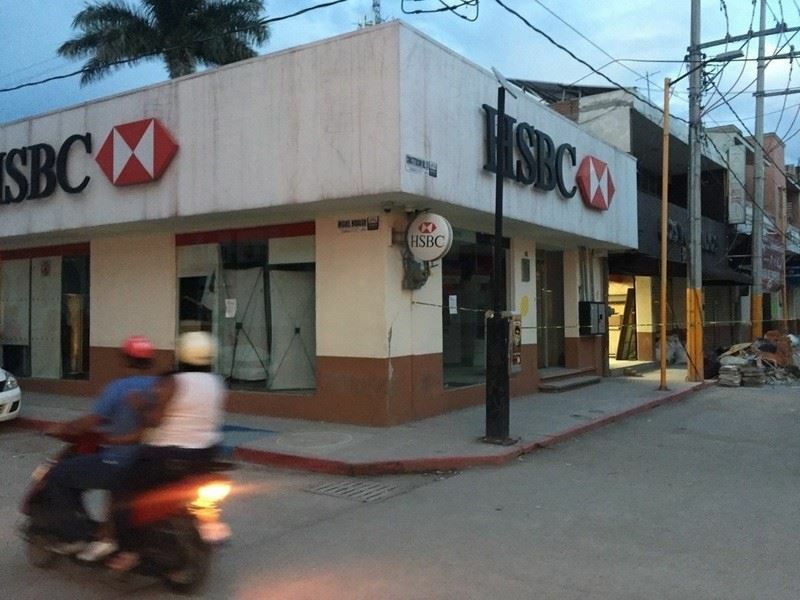 · Banks: 3 out of the 4 banks in the town were severely damaged and closed for business. The last bank was not severely damaged, but was closed because of adjacent building damage. This required residents to drive at least 45 minutes to the nearest bank. 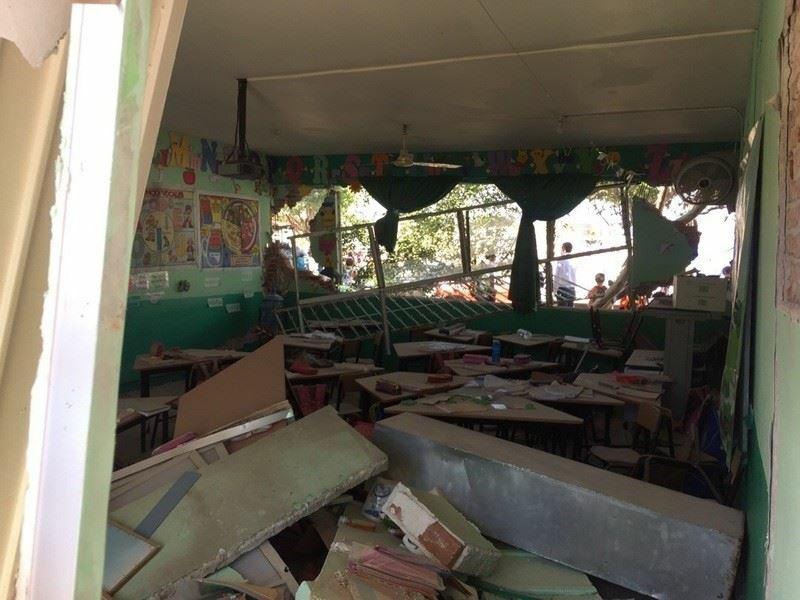 · Schools: One of two of the elementary schools was shut down after the event due to severe structural damage of the buildings. One of the teachers felt the practice earthquake drill from earlier that morning helped them evacuate the buildings in a safe and orderly manner. She told the SCRT the motion was slow and long at first. She told the kids to calmly get up leave the building. Then the motion became very violent with ground moving “up and down” making it hard to walk. Once this happened, everybody ran out of the building in a panic. Fortunately, no one was hurt. · Government: The small government “city hall” was shut down even three weeks after the earthquake, when our team arrived. They informed us that two people were killed by the clock that was above the government building as it collapsed. The small government had moved to an undamaged building and tents when our SCRT team arrived. 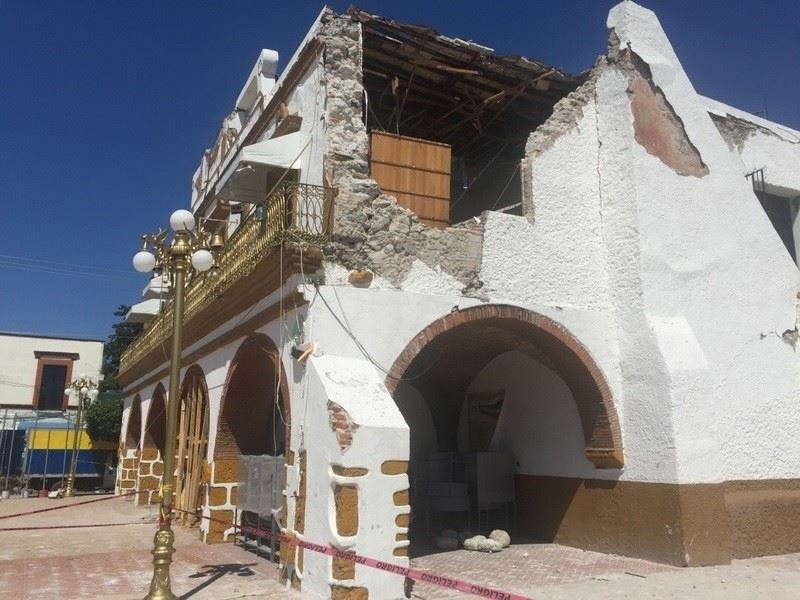 · Shelter: Colonia Zapata was the most devastated in the entire town. There were dozens of homes that collapsed or had severe damage. When SCRT arrived to the town many residents had begun to repair their homes. Some were living in tents since their homes were already demolished. The town had set up a shelter in a nearby pre-school and a technical school was using their cooking services to prepare meals for 500 people daily. However, when asked if they would consider moving to another town the displaced residents told us they would stay and re-build. In these areas there is a strong sense of community. The SCRT came across 2 young men volunteering to provide shelter and aid to displaced people. One of them was a student in Mexico City in a college that got severely damaged and closed. The other one lived in Oaxaca and left his business to come help the people of Jojutla. These two helped set up a tent at the entrance of the town used to distribute food, diapers, toiletries, and other necessities to people in need. 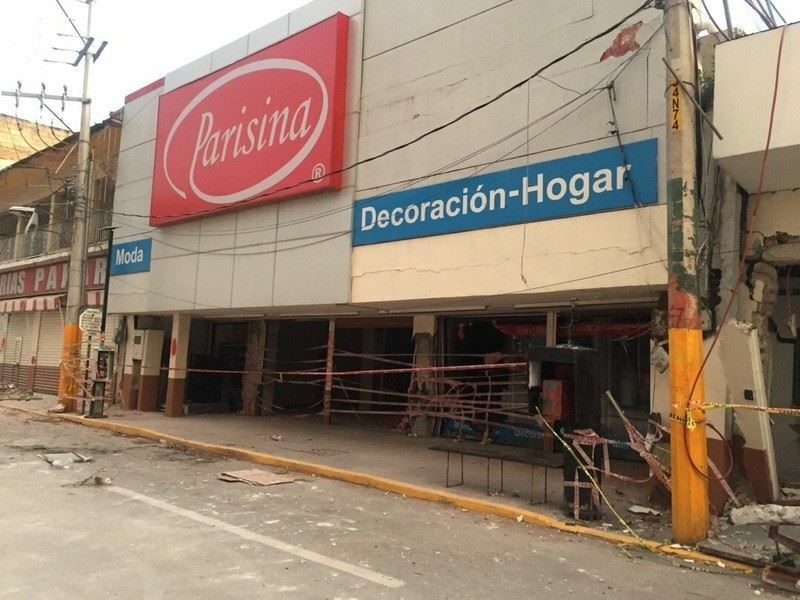 · Commercial Center Approximately 17 people died in the entire town. However, this was not the only tragedy in the town. Their entire commercial center was destroyed. The town has two major downtown streets that hold all of their retail stores and every single one of them was closed because it or a nearby building was severely damaged. Everyone that made a living in the area is out of work until they be re-build these stores. The SCRT is happy to announce that we have videos that will allow SEAOSC members to view neighborhoods and buildings damaged by a large earthquake in a way that was previously not possible. The SCRT had three 360-degree cameras that were used to survey damaged neighborhoods and buildings every day during the trip. The SCRT wants to specifically thank Ken O’Dell for being diligent in taking these videos throughout the trip despite most people thinking he had lost his mind evidenced by him holding the small devise above his head and walking like a zombie. The lessons learned from this trip will always stay with us. 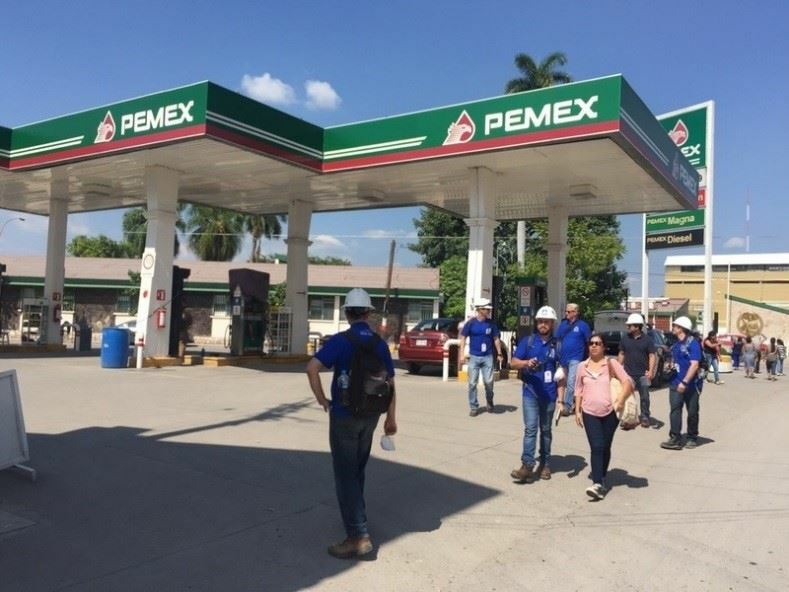 As mentioned before, as engineers, we travel to areas affected by a seismic event to learn from the damage, but inevitably we are always drawn into the community’s ability to cope with these difficult situations. As leader of the team, Daniel Zepeda would like to thank the Structural Engineers Association of Southern California (SEAOSC) for supporting us in this trip. I would also like to thank my team members for putting up some long hours during our daily walks. Finally thanks to all those in Mexico that helped us out during our visit. Gracias Mexico and may you re-build quickly and well! 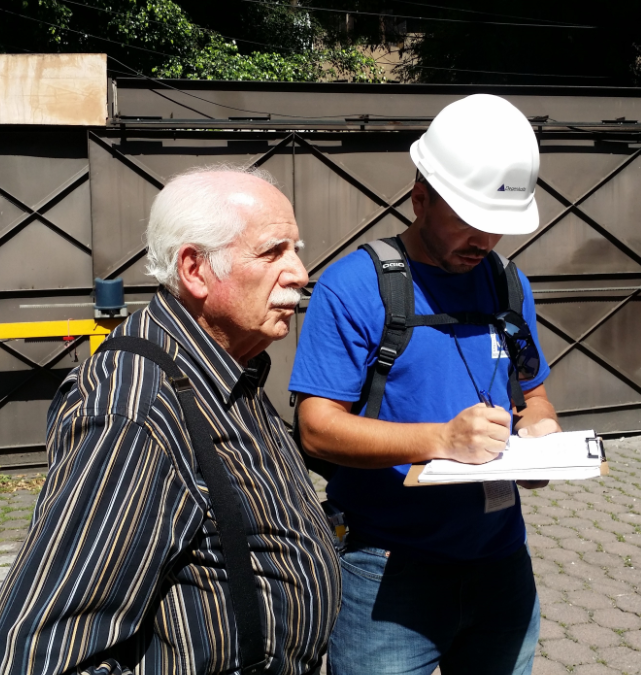 On Saturday, the SEAOSC Safer Cities Recon Team (SCRT) visited the neighborhood of La Condesa. 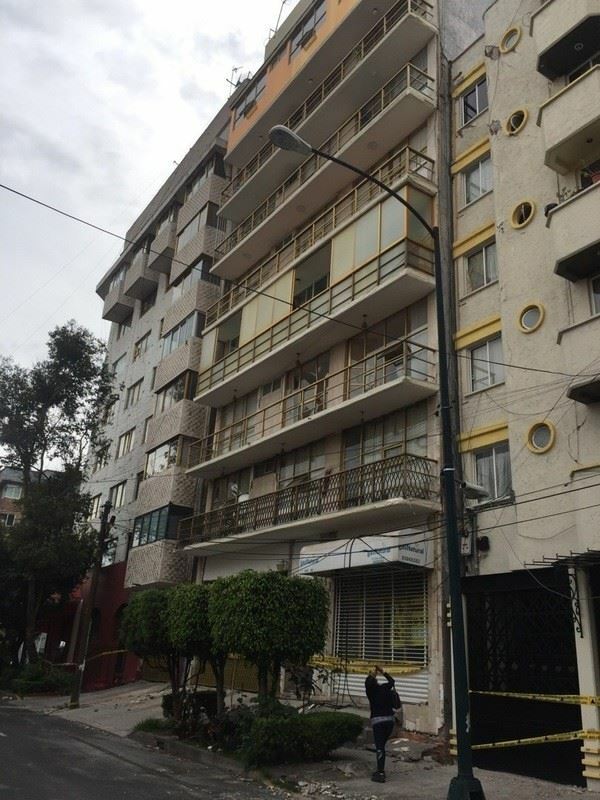 Located in Colonia Hipódromo in the Condesa area of Mexico City. This is a fashionable neighborhood near large beautiful historic parks, but had many buildings with collapses or major damage. 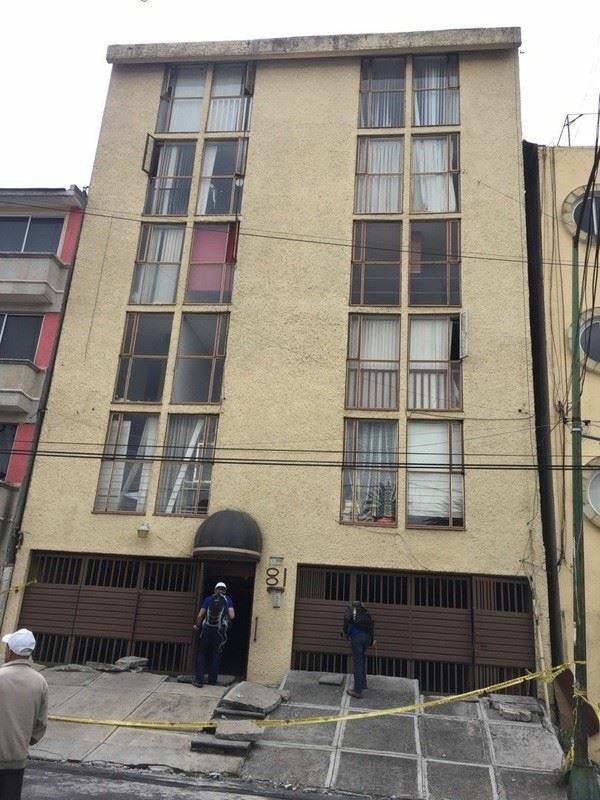 Our first stop, adjacent to Parque Mexico, the SCRT visited a collapsed 8-story building wherein the 6th story had collapsed. This particular building was constrained on both sides by 6-story buildings, and the partial collapse occurred on the floor immediately above the adjacent roof levels. 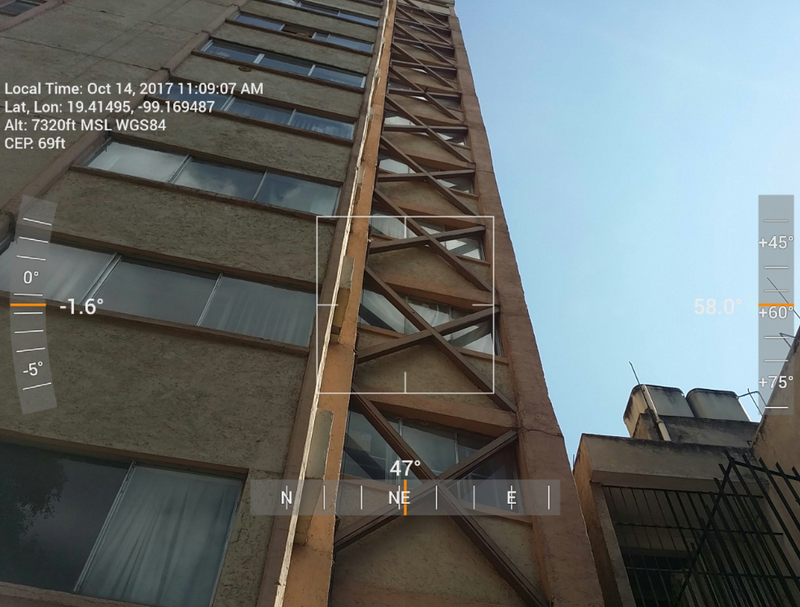 Next the team visited a 14-story building at the end of the same block, built in 1967, and retrofitted in 1984 (prior to the 1985 earthquake) with steel braced frames and other elements. The team was able to access the building and view the nearby partial collapse building from the roof. However, once on the roof, in the interest of getting best quality 360 degree photographs, Ken and Daniel decided the roof was not high enough and climbed the final ladder to the penthouse roof. The team met the owner, Alberto Buzali, who had performed the 1984 retrofit. He was able to describe many details of the building’s performance, the retrofit and the structural details. As is true of many buildings in Mexico City, this building had a basement level which serves as the water cistern for the building water supply. At the next stop, the team met with the owner of an operating restaurant, Coral de la Vega, who also had lived in a nearby building. Although the restaurant had re-opened, her apartment was still damaged. The team was able to provide an opinion that the building could likely be repaired and returned to livable conditions. She was able to describe the experience of the earthquake, the business and living aspects to inform the team about the resiliency of the community. 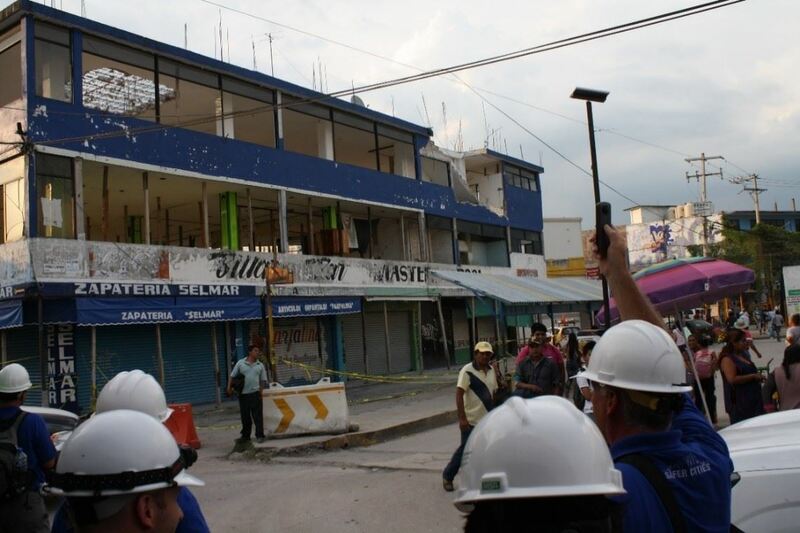 At this point, Alex, the architect working with Benito Juarez, rejoined us to observe damage, even though this district was outside of his jurisdiction. Later, the team met with a restaurant worker nearby, Erik Juarez, who was able to describe the complete collapse of the building across the street from the restaurant. He and the other workers in the restaurant were able to describe the resiliency of their restaurant as effected by the adjacent complete building collapse. 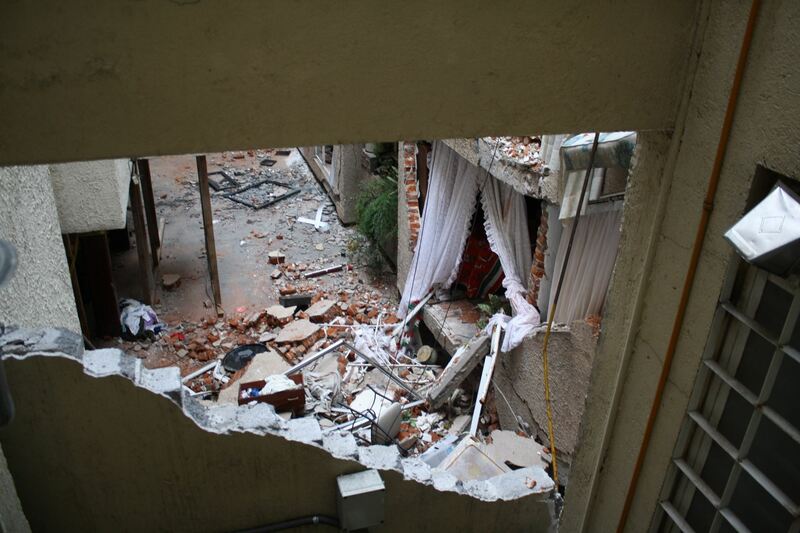 The team visited a single family house adjacent to a damaged mid-rise. The house had had brick and other debris fall on the property, and although it did not cause heavy damage to the house, nevertheless the family was very concerned about future performance of that building and the damage to their house in future earthquakes. At dinner, it was decided to have a test for the SCRT: the team split into two subteams, and a building was picked that was known to have damage but no collapse. 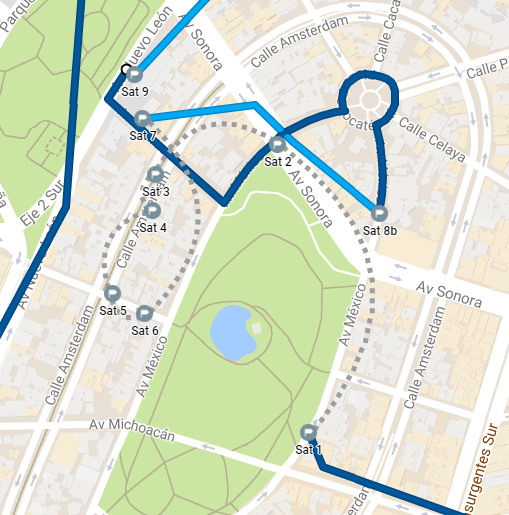 Google street images were used by each team to draw the anticipated damage patterns, with the anticipation that each subteam would be scored as to the accuracy of the damage prediction. A site visit was performed after dinner. Alas, it was realized that a building had been inadvertently chosen that had no damage, so there was no winner as there was negligible earthquake damage. Later that evening, a second test was developed for another building. The second test was successful, as both teams picked many of the damaged elements, although one subteam performed a bit better than the other at the predictions. Along the way, a building was encountered that had been supported by deep foundations such that the static settlement of the surrounding ground surface had necessitated building-up of the stairs and driveway into the property. It appeared about 4 feet of settlement had occurred to the surrounding ground surface, but that negligible additional seismic settlement had occurred from the recent earthquake. Most buildings in Mexico City utilize a floating foundation such that the building can safely move down along with the surrounding ground surface. Building with some distress. This building was notable as a building supported on deep piles such that the settlement of the surrounding ground had necessitated building up the driveway and stairs to reach the entrances. Finally, walking between sites, the team was met by a journalist, Martijn Grimmius, and his friend from Holland. They accompanied us to the next building review, and were interested in the process we were using to evaluate buildings and the community resiliency. 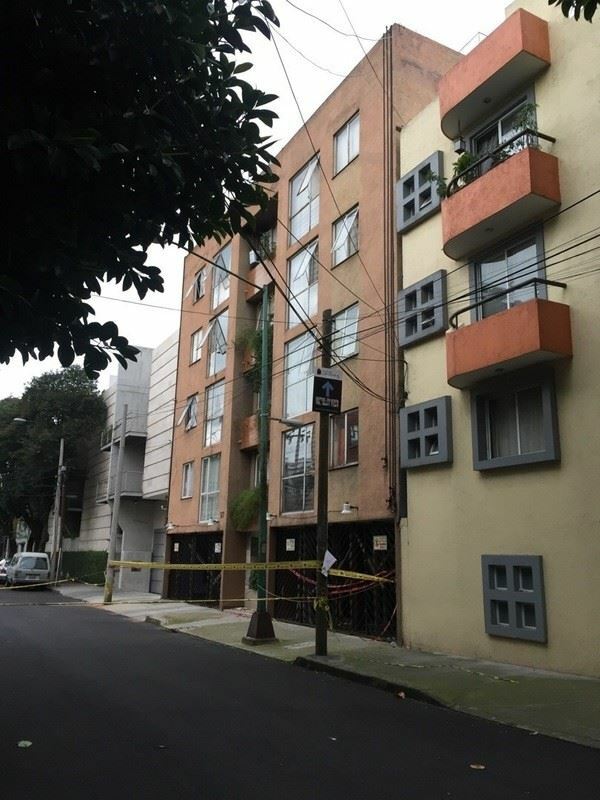 The last evaluation was of a pre-1985 mid-rise building that had been damaged and was not occupied, but the adjacent occupied mid-rise building tenants were very concerned about the safety of their property, which has been a recurring theme throughout the trip. Since night had fallen and it had started raining heavily, the day ended for the SCRT. On Friday the SEAOSC Safer Cities Recon Team (SCRT) travelled south to the small city of Jojutla, located approximately 100 km east of the September 19 Mw 7.1 epicenter (compare this with Mexico City, which is located approximately 120 km from the epicenter). Jojutla does not have the unique geology of Mexico City, but has an abundance of traditional Mexican concrete and brick construction, combined with a build-it-yourself, largely unregulated, construction industry. Buildings typically were 1-2 stories in height (increasing to 3-4 in the town center), consisted primarily of a concrete frames infilled with brick (some adobe construction was also encountered), very irregular in plan and elevation with open fronts, discontinuous bearing walls, or lacking a secondary gravity system altogether. The SCRT team met up with locals who guided the team around the city, and quickly learned how devastated the city was. Every street the team turned down seemed to be littered with brick and concrete rubble. Many buildings had collapsed, and many more were nearing collapse. Locals were confused about the safety of their damaged homes, and were hoping for reassurance that their house was repairable, and that they could occupy their house while repairs were being carried out. Unfortunately, many homes were beyond repair. The SCRT offered their professional opinion, which was often not the answer locals wanted to hear, but were pleased to simply have some idea of what to expect. Jojutla was a great example of where resiliency is critical to the prosperity of the community. Jojutla is a hub for the surrounding agricultural industry, and with many of the main streets cordoned off, a significant portion of the city had ground to a halt. Scattered amongst the collapsed buildings were a number of buildings and businesses that could be reoccupied had it not been for the neighboring buildings. The SCRT team interviewed volunteers providing relief effort, and were amazed at the savviness of volunteers coming from out of town to help distribute and gather supplies. Locals had taken it upon themselves to dust themselves off, and get on with the rebuild, rather than waiting in, what would likely be, a very long que. Unfortunately, the rebuild efforts were simply a repeat of the type of construction whose fate was met less than one month earlier – a clear indication a shift in construction is necessary. The team finished the long day interviewing the members of one of the team members’ family who lives in nearby Zacatepec. As is the case for many Mexican families, their roots run deep in these communities, and despite the devastation they are here to stay. Relocation is not an option. Among the buildings surveyed Wednesday night, the Safer Cities Recon Team (SCRT) came across an evacuated building with minor damage on the exterior. Tenants from this building are living in tents outside of the building. A district inspector at the site told the team he was unsure of some of the yellow tag designations and if we, as engineers, said the building should have a green tag, he would give the building a green tag. With a green tag, residents can re-enter the building. The inspector explained he was a volunteer and architect by trade. 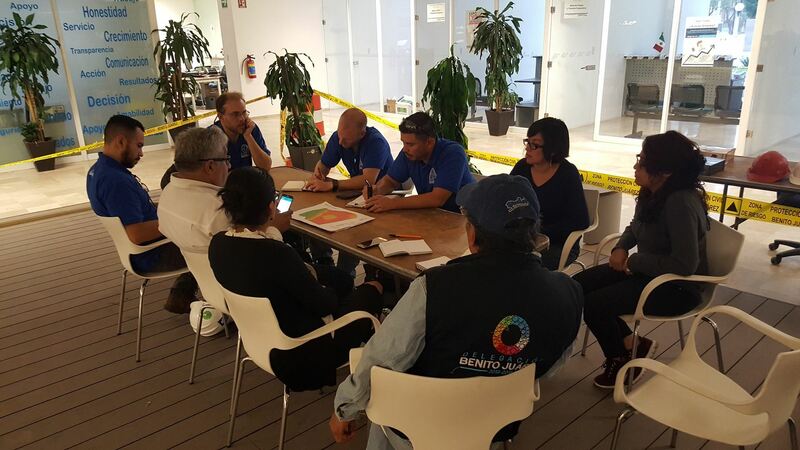 Seeing a need and a chance to help the displaced tenants, the team decided to go to the Benito Juarez District Office of Civil Protection to offer our assistance. Early Thursday morning, the SCRT met with the Benito Juarez District Director of Civil Protection, Jorge Cruz. The team found the Director was very busy responding to urgent requests. The Director was happy to see us and began explaining the status of the recovery effort in his district. We learned, as of the latest count on October 4th, roughly 800 buildings have been inspected out of the 2100 requests. The Director explained that not all of these requests were valid as people with previously damaged buildings not damaged by the September 19th earthquake were trying to take advantage of government aid. According to the Director, these fraudulent requests are making it difficult to find the buildings that truly need assistance. As we finished our meeting, the Director received a phone call with another emergency request. Ken O’Dell and Raul Jimenez volunteered to join the Director, while the rest of the team returned to the buildings from the night before. 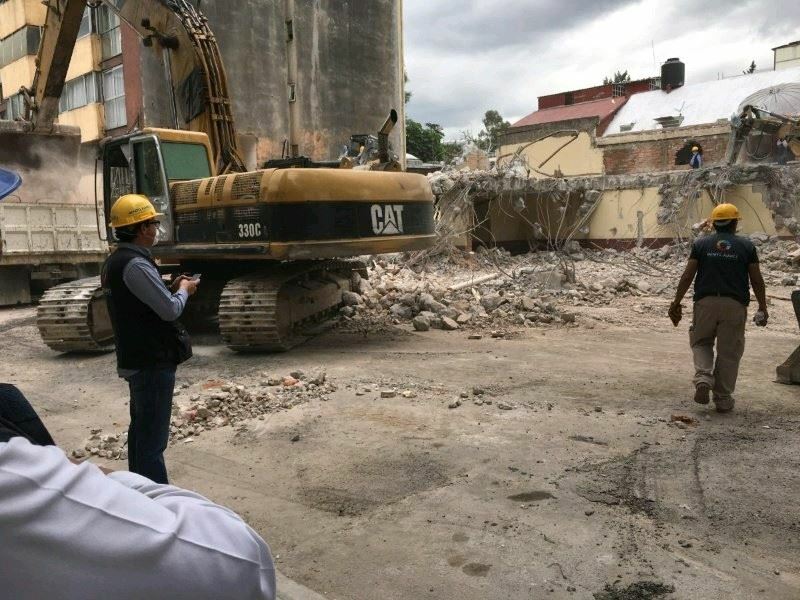 At the scene of the emergency request, Ken and Raul were asked to advise the Director on appropriate demolition techniques for a collapsed building being supported by an adjacent building. Ken and Raul provided advice and highlighted that the heavy duty equipment used for other collapsed structures may endanger adjacent buildings to this site and suggested alternate techniques. Team members Daniel Zepeda, Dion Marriot, Marty Hudson, and Russell McLellan returned to the building from the previous night with a potential to be green tagged. 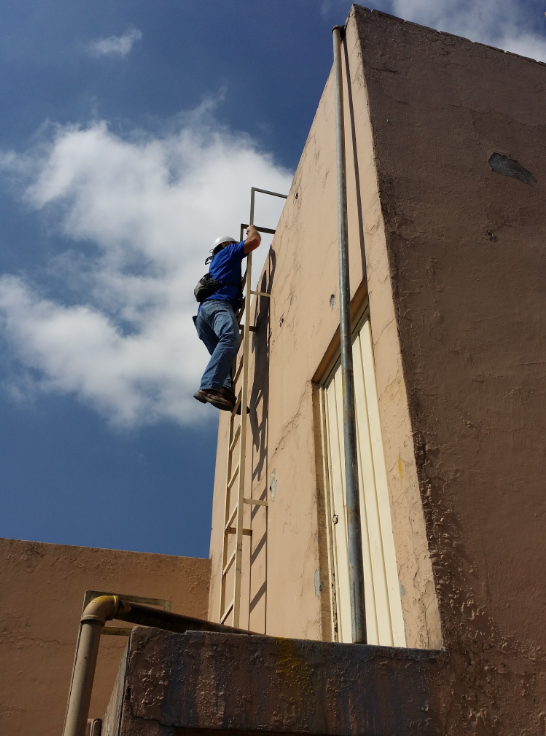 The team members gained access to the structure and performed a thorough assessment. Two additional buildings were found behind the building of interest. 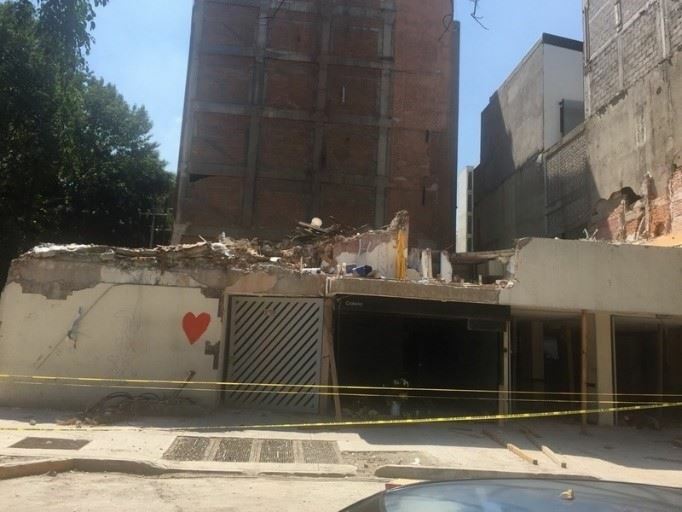 The team found concrete columns with significant damage at the first level in the center building which posed a stability risk for this building and the adjacent buildings. 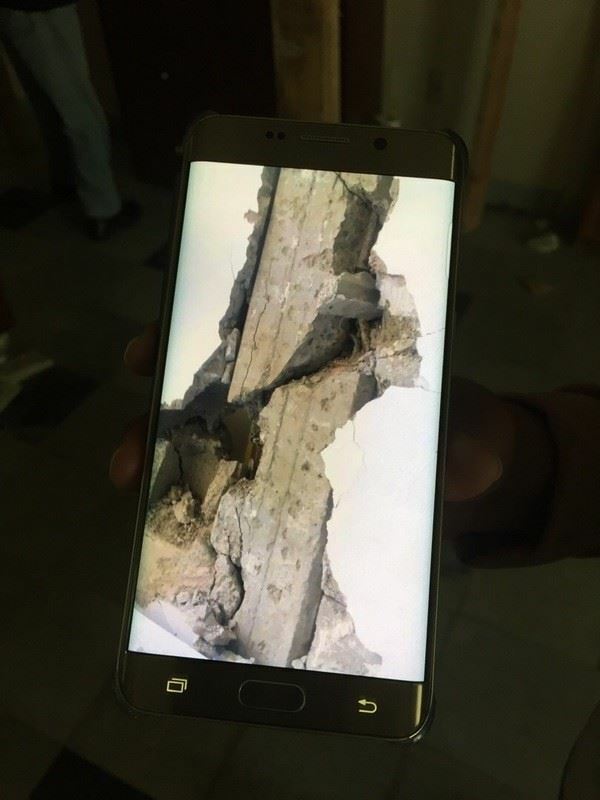 Based on this damage, the team agreed with the government’s assessment that the damage is repairable, but the buildings are not occupiable. Displaced tenants were thankful to the team, despite hearing the news they still could not enter their building. With “Engineers from the United States” validating the government’s assessment, the people felt assured that there was in fact a real hazard. The team finished the day with a debriefing meeting with the Director. 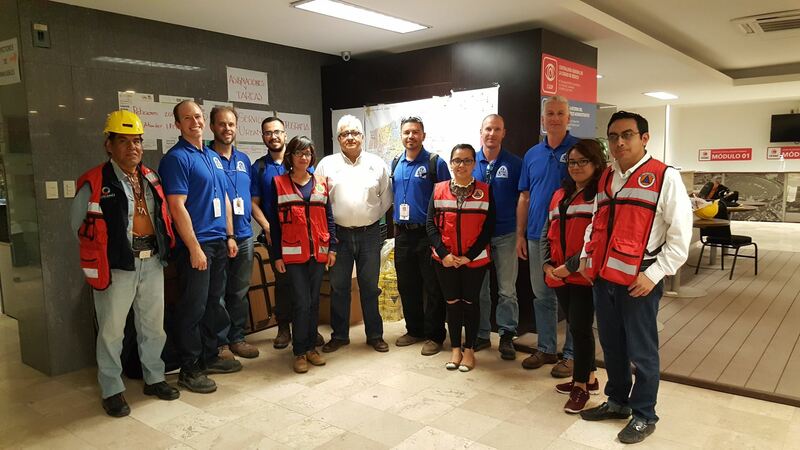 The day was a huge success, as the team was able to get an inside look at a local jurisdiction’s response to the earthquake as well as lend our expertise to the people living in Benito Juarez displaced by the earthquake. Tomorrow will be a big day as well. The team plans to visit a collapsed school that killed 16 children as well as Jojutla, a small town closer to the epicenter, which was severely damaged. Stay tuned! SCRT Team with Benito Juarez officials and volunteers. Left-to-Right: Alejandro (Architect, Volunteer City Inspector), Russell, Marty, Raul, Volunteer, Jorge Cruz (Director), Daniel, Volunteer, Dion, Ken, Volunteer, and Volunteer.